View of water fountain sculpture. This photo appeared in the North Shore Review, Thursday, Sept. 7, 1950, p.14. "Famous fountain beautifys Park Royal. A strikingly beautiful decorative feature of Park Royal Shopping Centre is this Carrera marble fountain which has a long and interesting history.The design was prepared by P.W. French of New York and was carried out by Salliere, a noted French sculptor...For some time it was the property of the late John D. Rockerfeller (sic) and later came into possession of the late Lord Southborough, a director of British Properties.No suitable location could be found...in British Properties in 1936. It was carefully crated and stored until now when it is displayed to the public for the first time at Park Royal...The fountain has a central figure seated on a huge rock playing a guitar (sic).Four bambinos struggle to reach her, one falling backward into the water. 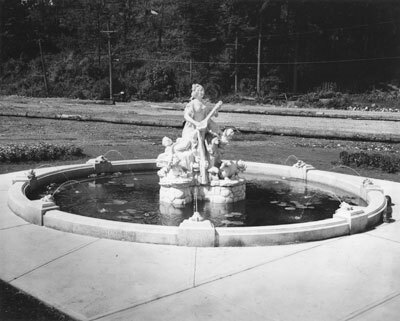 The granite basin is of spacious dimensions, with eight frogs, each spouting three streams of water into the pool." Scanned July 2011 using Epson Perfection V700 Photo at 300dpi and 100% of original image size. Alternate Versions: Lossless TIF from original scan at 300dpi and 100% of original print. W24 x H20 cm black & white print on photo paper.